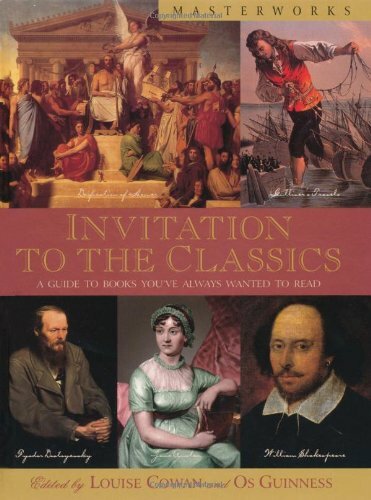 Invitation to the Classics (Masterworks) Baker Books Guinness and Louise Cowan gather over 50 brief essays by a number of respected Christian literary scholars that extend invitations to readers to experience anew or for the first time the wonder and the beauty of selected classics. Guinness and Louise Cowan gather over 50 brief essays by a number of respected Christian literary scholars that extend invitations to readers to experience anew or for the first time the wonder and the beauty of selected classics. One of the many purposes of Invitation to the Classics is to warm the heart to the masterworks of Western civilization. In doing so, editors Louise Cowan and Os Guinness hope to "reawaken ... people to the vibrant heritage of these classics that are rich in themselves and in their 2000-year relationship to the Christian faith." From Homer to Chaucer, Dickens to C.S. Lewis, each author receives a chapter that includes a biographical sketch followed by a thorough summary of the classic(s) he or she penned. The "Issues to Explore" sections at the end of each chapter pose penetrating questions for interrogation of the text as well as recommendations for further study depending on whether your scope is technical, theological, analytical, critical, or biographical. Once you read Invitation to the Classics, you may agree with C.S. Lewis that we must "keep the clean sea breeze of the centuries blowing through our minds, and this can be done only by reading old books." In postmodern society, truth no longer exists in any objective or absolute sense. At best, truth is considered relative. At worst, it’s a matter of human convention. But, as Os Guinness points out in this book, truth is a vital requirement for freedom and a good life. 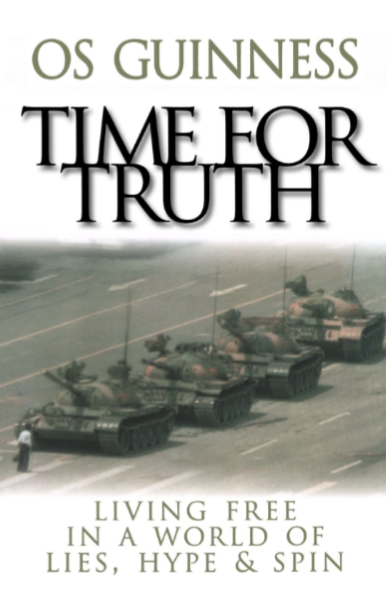 Time for Truth urges readers to seek the truth, speak the truth, and live the truth. Guinness shows that becoming free and truthful people is the deepest secret of integrity and the highest form of taking responsibility for ourselves and our lives. 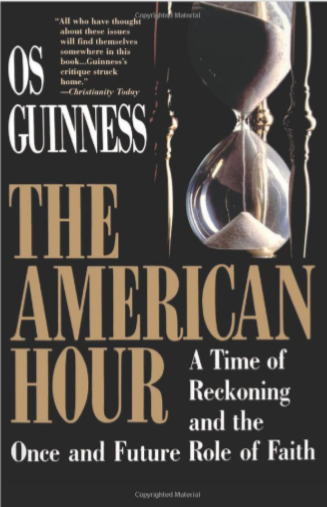 Now in paperback, this engaging book will interest Os Guinness fans, thoughtful readers, and those concerned with moral, political, and cultural issues. This call for a robust and courageous defense of the use of reason in search of ultimate truths is a welcome gift. Have you woken up to the journey of life? Have you reached a point where you long for “something more”? Have the things you have striven to achieve turned out to be far less than enough? 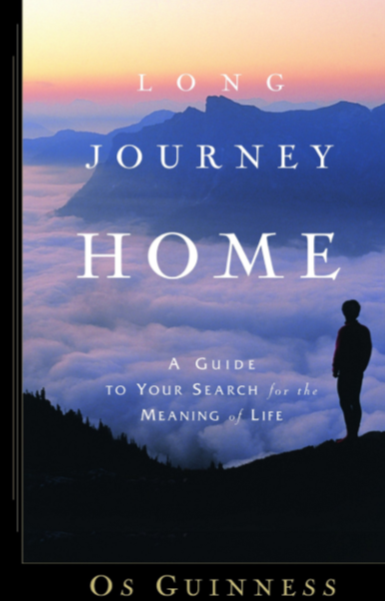 Do you desire to unriddle life’s mystery and pursue a life rich with significance? In one of the world’s great ironies, the Christian faith contributed decisively to the rise of the modern world, but has been undermined decisively by the modern world it helped to create. The Christian faith has become its own gravedigger. 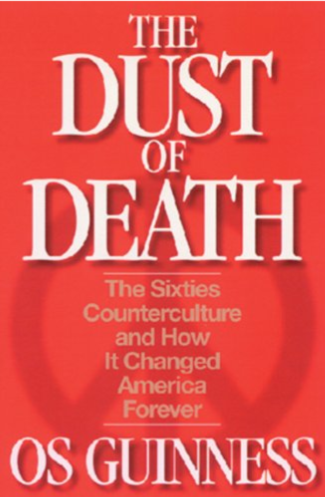 In the 25 years since philosopher and social critic Os Guinness first published The Gravedigger Files, much has happened: the fall of the Soviet Union, the rise of the computer age, the reemergence of China and India, the rise of Islamic terrorism, and the worldwide revitalization and politicization of religion. The central mystery of Dr. Guinness’s spy novel inspired by his affection for John le Carré thrillers remains unsolved: Can Christians regain the full integrity of faith in Christ while fully and properly engaged in the advanced modern world? 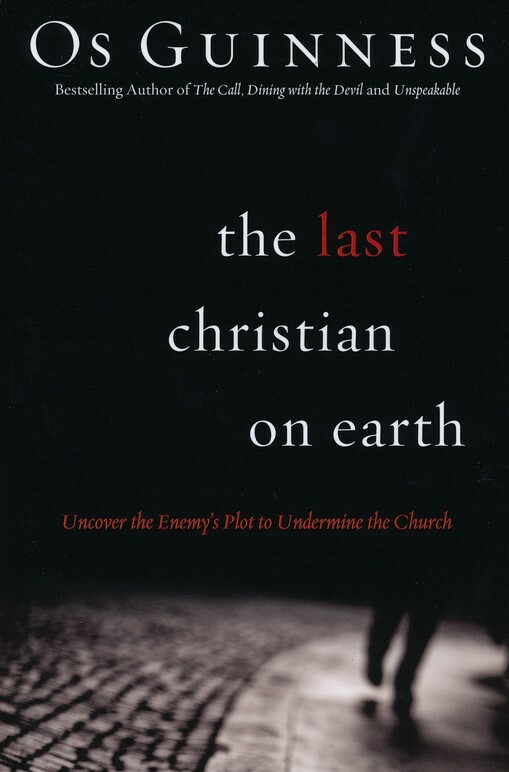 This new edition of The Last Christian on Earth, which includes previously unpublished top-secret memos, is Dr. Guinness’s parable about the future of the Christian church in the West. Written in the grand tradition of le Carré, Fleming, and Clancy, this thriller pays homage to the genre while transcending it–because the real-life ending has yet to be written! 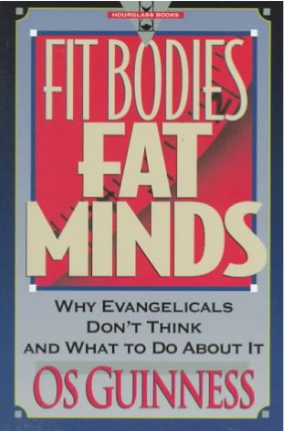 Os Guinness traces the retreat of the evangelical mind and the dumbing down of evangelicalism through popular culture. But this book goes beyond mere analysis. It is a strong call for reformation of yet another place where evangelicalism in not evangelical enough. The buzz among evangelicals today is about relevance and reinvention, about new ways of “doing church” through revising, innovating, borrowing, mixing, and experimenting. Yet, says Os Guinness, in our uncritical pursuit of relevance, Christians have actually become irrelevant. By our determined efforts to redefine ourselves in ways that are more in line with the modern world than are faithful to Christ, we have lost not only our identity but our authority and significance. 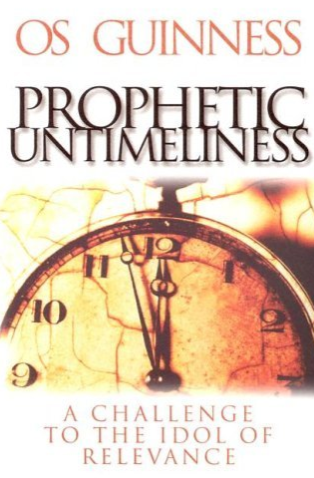 Prophetic Untimeliness addresses this issue by giving practical, constructive solutions for living with integrity in the midst of modern pressures. Guinness explores what it means to be both faithful and relevant, and how to be truly relevant without being trivial or trendy. Readers will be challenged to develop “resistance thinking,” an approach inspired by C. S. Lewis that balances the uncomfortable truths of the gospel with the pursuit of relevance. Only by being true to Christ and living with integrity and wisdom will we meet the needs of a world that is hungry for some really good news. Guinness also examines the historical role of religion in American society and its integral function in American public life. He explores how religion came to lose its power as a vital shaping force of America’s moral and cultural order, and he considers the consequences of this loss. He then establishes four scenarios that range from the continued decline of religion in public life to a resurgence of faith, showing how each possible outcome could affect American society in the upcoming century. Examining closely the recent controversies over religion and politics, Guinness concludes by setting forth a vision of how we can move beyond these struggles and provide America’s diverse faiths with a revitalized and constructive role in public life. A profound and excellent book for doubters and their friends who want to help. Do you have significant doubts about God? Are you afraid to doubt, much less admit to anyone that you aren’t fully convinced of God’s faithfulness? Are you so torn by your questions that life is losing its meaning? 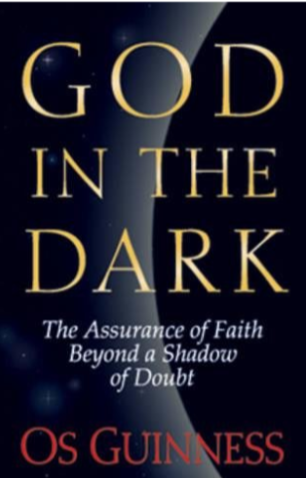 For those who are unsure of God’s trustworthiness–and for those who are in a dark place, wanting to know “Why?” or “How long, O Lord?”–God in the Dark is a must. It puts a human face on the problem of doubt and examines it thoroughly. In a way that will respond to your questions, settle your fears, and strengthen your faith. Clear, steady explanation of what doubt is and how it is to be dealt with. There is nothing like it in print. Guinness charts the journey of a generation, from the erosion of Christianity to the failure of the counterculture to provide an effective alternative to faith. The author calls for a new direction for the Western world, one which combines conviction with compassion and deep spirituality.